Fitness Equipment Source / Blog / Blog / Does Exercise Reduce Stress? In this fast-paced, ambitious society in which we live, stress has become an increasingly common problem among people of all ages, regardless of their gender, income levels, education levels, places of residence, etc. Although a certain amount of stress is necessary (and even positive) in a person’s life, too much stress can wreak havoc and create health problems, if not acknowledged and dealt with in a salubrious manner. Stress-filled lifestyles often lead to emotional, mental, and physical problems. Among those problems are depression, sleep disorders, weakened immune systems, heart disease…even difficulty socializing with other people. Too much stress sends the body into its self-protection mode and triggers the autonomic nervous system’s “fight or flight” response. This mechanism is necessary to our survival…up to a point. It is the body’s attempt to return to normalcy. Yet, when the body’s alarm system is triggered excessively, it can be even more harmful to one’s health than whatever stress or originally triggered this response. Therefore, it’s very important to address the issue of stress and to learn how to manage it, so that we can lead healthy, productive, and enjoyable lives. Corbin and Lindsey go on to say that exercise “reduces the levels of epinephrine and norepinephrine, the catecholamines that prepare a person for fight or flight, and thus reduces the end result of stress.” As a result of a regular exercise program, you will become more fit and healthy, as well. And, the healthier you are, the more mentally, emotionally, and physically capable you are of coping with stress. Exercise Helps Manage Stress – Just Do It! Whenever I feel really stressed, exercise tends to not only help relieve that stress, but it also has the power to divert my attention and thoughts to something more pleasant and positive. I’m happier and healthier! My energy level is increased! My mental focus is clearer! And, I also notice an improvement in my self-esteem! Exercise can also help you reduce belly fat and live a longer life! Honestly, what’s not to love? So, if you’re among the great masses who face excess stress in their everyday lives (as many of us do), get out there and exercise! Incorporate more physical activities into your daily routines to release tension and frustration. 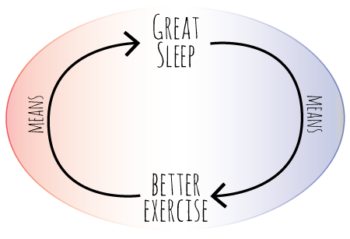 Be sure to choose an exercise program that you find enjoyable and easy to stick with! And, then…as the Nike slogan goes, “Just do it!” You’ll feel better in the long run! We’re here to help! If you need information on how to purchase an elliptical to start exercising, check out our Elliptical Buyer’s Guide. Plus, you can find our latest Best Buy Elliptical recommendations.